Hello there! Here's a card I made a while ago but never shared on my blog, using all Purple Onion Design stamps by Stephanie Ackerman and Stephanie Tafoya. All the images were paper pieced with My Mind's Eye and Basic Grey papers. The house, heart, clouds, and sun are from the Home Sweet Home set. The sentiment is one of four in the Homegrown Sentiments set, the zig zag "grass" uses the Stitches set, and the flowers are from the Doodle Flower set by Stephanie Tafoya. I used dimensional adhesive on the sun, cloud, and heart for a bit of dimension. I wish I had a house that looked like this! I'd like all of you to know I'll be taking a little blog break. I have some health issues to take care of and it will give me some catch up time to visit your wonderful blogs while I'm recuperating. Thanks, always, for stopping by! I hope you all have a great day...and a great week! This week, Purple Onion Designs and Tombow have teamed up to showcase each other's products on their respective blogs. Here are the cards that I made using Tombow's Dual Brush Pens. I loved using the blender pen and it felt like I was watercoloring--without the water! I stamped the images with Staz On ink on watercolor paper and brushed some ink onto an acrylic block to use as my palette. I loved how effortless it was to get the look of watercoloring with just a few swishes of the blender pen. On my second card, I colored the flower using the brush pens and blender pen on watercolor paper. I trimmed it out and used Tombow's Foam Tabs to attach it to the card base. There are two sizes in a pack and I was able to use both sizes on different parts of the image. The zig zag stitches were colored using a brush pen and since I used it to color in the leaves, it was an exact color match. Hello, hello! 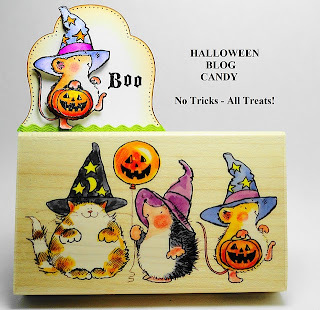 Today I'd like to share a Halloween card made with a new Penny Black stamp set--Scary Halloween. I was planning to make a Polaroid, but the image went way beyond the frame, so it became a regular sized card. I hope it still looks like a Polaroid. I ink distressed a square piece of cardstock with Black Soot, Pumice Stone, and Orange Marmalade distress inks and water splotched it for a spooky sky. The main image was stamped and colored with Copics. A few bats from this set were stamped flying off in the distance as well as the perfect sentiment to the owl's expression. Gray cardstock was embossed with Cracked, a Tim Holtz texture fades embossing folder and the spooky cute owl and Polaroid frame were attached. My first Halloween card for the year is done! Our kitchen renovations are well under way and you're welcome to go here to see pics of an almost completed project. I'll be sharing a photo of the finished kitchen here on my blog when it's all done and pretty. Thanks so much for stopping by today! Have a great, crafty week! A Sweet Birthday Blog Hop! Hello, friends! Welcome to Sweet Stamp Shop's blog hop in honor of Nicole's dad whose birthday happens to be today! To celebrate this momentous occasion, Nicole is offering a 20% discount off your total purchase when you enter code DAD20 at checkoout. How sweet is that? And free shipping, too! (Only to the US and Canada.) This birthday special is good from Thursday, September 15th thru Sunday, the 18th. Also, how would you like a little taste of something "sweet" to add to your stamp collection? Leave a comment on my blog and all the blogs on the hop (there are only 9 total) between now and Sunday, the 18th, and we will draw the names of 2 lucky winners for ONE STAMP SET OF YOUR CHOICE! Winners will be announced here on Monday, September 19th. I hope you arrived here from Lindsay's blog. If not, start at the beginning and hop your way through the design team's blogs for lots of sweet inspiration. Here is the blog hop order. Don't forget to leave some sweet comments along the way--I know the DT will really appreciate them! 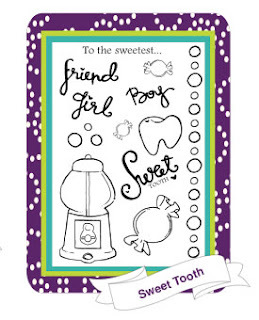 For my simple card dedicated to Patrick, I used the Sweet Tooth stamp set. I just love that gumball machine! The "Happy Birthday" was used from the Scootin' By stamp set. I used a blue violet/green/orange color combo and colored all the images with Copics. The gumball machine was attached with dimensional adhesive. I scribbled in the "guy" part of the sentiment, and although I've never met Patrick, I just know he's a sweet guy, since Nicole inherited his sweetness! Remember to use the code DAD20 from now till Sunday for 20% off your total in the Sweet Stamp Shop store, along with FREE shipping to the US and Canada! Thanks so much for stopping by. Your next stop is uber talented Savannah! I can't wait to see what she has in store for you. Happy hoppin' and shoppin'! Sister Stamps came out with their second release and I just had to get Ayako because she's holding...an umbrella! These images are the perfect size--not too big or small and very quick to color with Copics. I tried to color her hair using Amy Young's fab coloring tutorial here and I know I need a lot more practice! I chose to give Ayako brown hair for a "hapa haole" look. Hmm...maybe our future granddaughter will look like this? I used a Sizzix embossing folder for the background and sanded the surface to make the embossing show through. There wasn't room for a sentiment so I stamped "Arigato" on the inside. A quick thank you card on its way to a dear friend. I hope you're off to a great week. Thanks for visiting today! 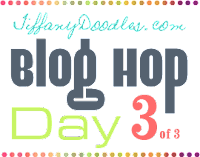 Welcome to the last day of Tiffany Doodles' Three Day Blog Hop! Tiffany graciously invited me to be a part of this blog hop and I was more than happy to join the fun. The theme for today's hop is Wings. We're all featuring cards made with Bird images from Tiffany Doodles. Donna Mikasa - you are here! And here's my card using the Warbler digital stamp. Isn't he a cutie? I loved this digi from the moment I saw it. I'm not too comfortable coloring realistic images, but I wanted to give this little guy a try. I colored the digi with Copics and cut it out using circle Nestabilities. I stamped Hero Arts' Designer Woodgrain background, and the sentiment is from one of my favorite sets. The seam binding was hand dyed with Vintage Photo distress ink. Your next stop on the hop is Deirdre's wonderful blog. I just know she has something amazing and inspiring to share! Thank you so much for joining Day 3's hop! Remember to comment on all blogs for your chance to win shopping sprees in the Tiffany Doodles store, and awesome digi stamp packs, too. The hop order for Day 1 starts here, and the hop order for Day 2 starts here. Winners will be announced tomorrow at Tiffany Doodles. Happy hopping! who lost their lives ten years ago. Oh my, I can't believe it's been a week since I've posted! Today I'll share another card made with Penny Black's Winter Swing slapstick stamp. This time, I stamped the image with brown ink, and colored it with Copics which gives it a softer look than colored pencils. I used Reverse Wonky Rectangles--AGAIN? ?--and embossed the frame with a Sizzix folder to add a bit of texture. The frame was distressed lightly with Antique Linen distress ink. The sentiment is by Kim Hughes for Cornish Heritage Farms. And if you ♥ Penny Black, visit my blogging friend Elizabeth Allan. She's having a giveaway of an adorable woodblock stamp together with a handmade card to a lucky commenter on this post. The only requirement? That you love rubber stamping and you'll give the stamp a good home with lots of inky love. I'm proud to say that I've received a card from Elizabeth, and just owning her card would be such a treat! Thanks for stopping by today! I'll be sharing more Penny Black cards soon. I hope whatever you do, you'll have a wonderful weekend! Hi there! Happy Friday! I'm proud to say I've finished another Christmas card. I used Penny Black's Winter Swing slapstick stamp and colored the image with Prismacolor pencils. I used Reverse Wonky Rectangles and framed the image, and used an SRM sticker for the sentiment. It was my first time using stickers and they won me over. They're easy to apply and there are a lot of sentiments in different sizes. I chose a circular design and affixed a little bow. I also added some Glossy Accents to the little stars. I forgot how fun it is to use Prismas again although I don't have them in as many colors as I do Copics--hence, the bright colors. It was nice to give my Copics a rest and the pencils were great for coloring in small areas on the image. I hope you have some fun plans for the weekend. Thanks, always, for stopping by! Hello, friends! Happy September! Honestly, where did the month of August go? This month will be super busy for me. Our kitchen renovation will begin and I'm trying to imagine what the demolition process will be like and wondering how much crafting time I'll have with construction going on. Wish me luck! For the recent Penny Black ATC swap, I was partnered with Jie Ying in Singapore. Here are her ATCs that she sent me using her Penny Black stamps. Aren't they adorable? Little works of art. I just love that hedgie! And she even included a birthday card for me--I love the little peephole! Thank you so much, Jie Ying! Lastly, here's a card that I made with Penny Black's Magical Mimi. I used pastels for a different look and colored the image with Copics. Her dress and the mushrooms were popped up with dimensional adhesive. Reverse Wonky Rectangles were used for the card base, and I embossed the frame with Cuttlebug's Swiss Dots embossing folder. I applied some Glossy Accents to the bee, butterfly, and ladybug, and some Diamond Stickles to Mimi's wings. The sentiment is from Nina Brackett's Heartily Yours Additions. Thanks, always, for stopping by! See you soon!